A man passed away in his wife's arms Christmas morning after battling glioblastoma for almost two years. We first brought you the story of David and Karen Tadlock back in August. David and Karen were high school sweethearts and married for 22 years. When David was diagnosed with the aggressive form of brain cancer, they tried to hold onto every precious moment together. David took part in a groundbreaking study, a non-invasive treatment called Novocure. Novocure is a cap that is placed on your head to kill or slow the growth of cancer cells. 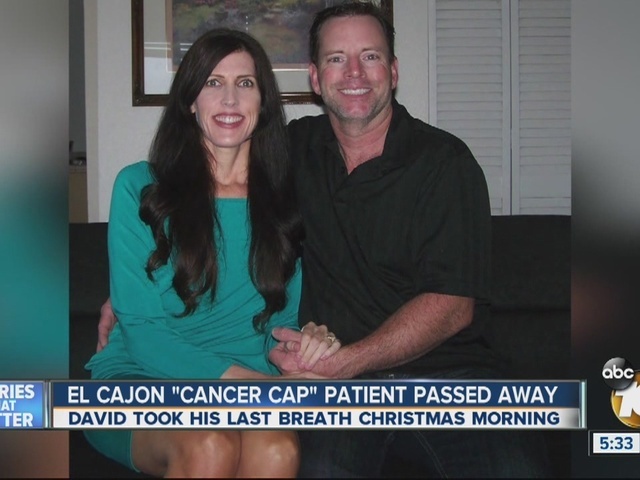 The treatment brought David and Karen a few more months together, but unfortunately David took his last breath in Karen's arms on Christmas morning. Karen told 10News she wouldn't change a thing as far as treatment and will continue to be a strong advocate to find a cure for this deadly disease. Their story is being studied at several medical universities. David was out of work for two years, and Karen was out of work for 17 months to care for him. Their friends set up a GoFundMe page to help pay for medical costs and memorial expenses.